Phelps’s National Map of the United States, A Travellers Guide. Embracing the Principal Rail Roads, Canals, Steam Boat & Stage Routes throughout the Union. 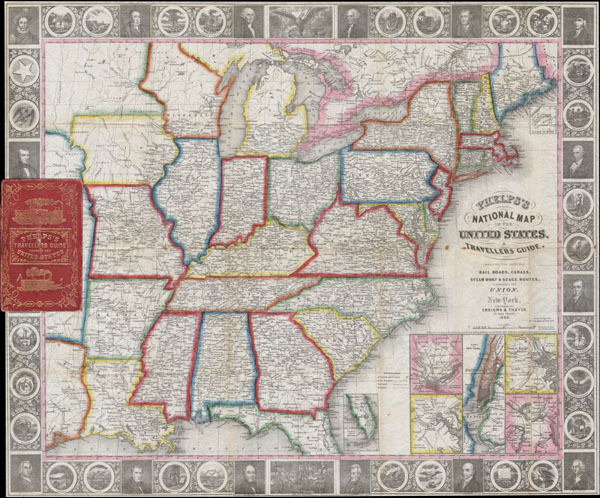 This is a rare 1848 issue of the first state of Phelps's map of the United States. Covers most of the eastern portion of the United States bounded on the west by Texas and two large unnamed territories to the north. Insets in the lower right quadrant illustrate seven important port cities: New York, Philadelphia, Baltimore, Boston, Birmingham, Cincinnati, St. Louis and Chicago. Two smaller map insets depict southern Florida and Northern Maine, the extremes of both of which are just off the map. The whole is surrounded by a fine decorative border depicting 30 alternating state seals and16 important historical figures. The state seal of Texas appears in the upper left quadrant, but California's does not. Shows the 'Trader's Route to Santa Fe' as it passes through Missouri and the territory to the west. Liberally names numerous American Indian tribes as well as Indian Burial Grounds, and trading depots. Ensign and Thayer issued a similar map in the same year that differs from this one only in that a Pittsburgh Inset is substituted for the Philadelphia Inset. Later editions, published after 1849 replace all seven city plans with a mini-map of the western United States. There is also a German language edition issued in 1849. This map was issued as an accompaniment to Phelps's Travellers' Guide through the United States; containing Upwards of seven hundred Rail-road, Canal, and Stage and Steam-boat Routes, accompanied with a New Map of the United States. This 70 page booklet is bound in red leather with an elaborate cover design stamped in gold gilt. Book features an index of place names as well as mileage charts between important cities on rail and stage routes. This original booklet is included with this item. Very good condition. This is an exceptionally nice copy, generally in very good condition, with superb unusually bright original color. Removed from original booklet (included) for conservation purposes. Minor verso repairs and reinforcement along original fold lines. Outer margins narrow as issued. Booklet in good condition exhibiting some wearing to the spine and edges as well as a couple of scrapes and scratches to the outer cover. Interior of book features numerous notes in pencil by original owners. Wheat, Carl Irving, Mapping the Transmississippi West, 1540-1861 (5 vols), page 731. New York Public Library, Map Division, 02-303 (1858 Edition) & 01-5129 (German Edition 1849). Library of Congress Map Division, G3700 1852 .A8 TIL (1853 Edition).